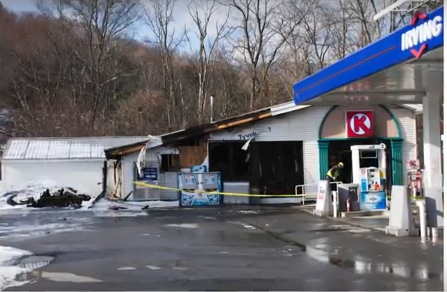 On February 1st the Circle K gas station in Ascutney, Vermont suffered damage after a fire that started around 2:30AM. The investigation into the cause of the fire is well underway, and the Weathersfield Police Chief William Daniels says the fire may have started during an attempted burglary. When crews arrived at the scene there was heavy fire and smoke coming from the building and the power, internet, and phone lines had been cut from the utility poles and the front glass doors were broken. Many departments responded including Weatherfield, Springfield, Ascutney, Reading, Hartland, Windsor, West Windsor, Claremont, and Cornish, as well as Weathersfield police department and Golden Cross Ambulance. The investigation is still very much active – so if you have information please contact the Vermont State Bureau of Criminal Investigations at 802.241.5260. And another fire story, this one out of Etna, as a fire destroyed a single family home on Stevens Road in Etna around 3AM on February 1st. No one was home at the time of the fire, but an employee of Hypertherm working at the time, called in the report to authorities after noticing a large flame on top of a nearby hill. When crews arrived the home was fully engulfed and now only the skeleton remains of the thirty eight hundred square foot home. Firefighters we able to save a detached two car garage. No foul play is expected. Lebanon school officials are discussing the high schools security measures after an incident at the school took place last month. According to the Lebanon Police Department, police were called to the high school around 9AM on the morning of Thursday, January 12th after a woman entered the building and was escorted off school grounds. The woman did no harm to anyone nor damage anything and voluntarily was taken to Dartmouth Hitchcock Medical Center. But now the school board wants to look at the security measures throughout the school system. The school currently has a buzz-in system for visitors through the main office once the school day has begun.